T finished his first week of summer camp last Thursday! T runs into his first day of “Phantastic Physics Fun!” summer camp and hardly even looks back to say goodbye to me! Can’t blame him really with all the LEGOs waiting for him there. Shared Science’s camps use LEGO educational building kits like this one and supplement with various other materials and projects depending on the theme of the week’s camp. Shared Science put on a fun and educational 4-day camp last week called, “Phantastic Physics Fun!” which focused around engineering and physical sciences for Grades 1-to-6. The camp was a LEGO-plus course that involved a kit with more than a dozen different LEGO builds from cars to magnet mazes, but it also incorporated other materials to allow the kids to build all sorts of things that they could take home, such as catapults, water balloon flingers, and marble ramps. On Day 3 the kids built LEGO mazes and raced one another by tracking a metal ball bearing through the paths by using a magnet below the table. Very cool! Another one of the magnet-based physics LEGO projects with Shared Science’s summer camp last week. I completely forget the name of this, but I believe it is modeled after a “Gauss cannon” concept (please correct me if I’ve got that wrong though). On the final day of camp, the kids put together a LEGO motorized car. The goal was to get it to run, and T’s worked with the help of the instructor and other classmates. Everyone works together at Shared Science to help each other succeed, another wonderful part of their devotion to education in whole. There was also plenty of solo LEGO time for all the kids. Here T is tweaking his car to make sure the drive gear keeps turning and connecting as it should. We learned about Shared Science from a local summer camp fair earlier this year. What first caught my eye was the price; compared to others I’d researched, Shared Science offered one of the if not the most affordable LEGO camp options in the Long Beach (CA) area by about $20/day. However, what kept my attention was the friendly and personable staff, who all were extremely helpful and tolerant of my endless questions about their camp programs. I also like that Shared Science is a non-profit organization devoted to educating children first and foremost. You can read more about their mission here. T gets some help finalizing his LEGO-built trebuchet at Shared Science camp. … And the trebuchet works! Mr. E helping T with part of his marble run on Day 2 of Shared Science Camp. While I said that T would be attending this camp on my Summer Camps 2013 page, I never really told the story of how he was allowed to enroll, which might be helpful since I just mentioned this was a camp for kids entering First Grade and T will only be entering Kindergarten. Basically, I politely asked if exemptions to the age minimum were ever allowed, to which President and Co-Founder Michelle Wells replied that it all depended on the particular child and their LEGO experience and that she’d like to meet the child in question if possible. T with his take-home catapult on his first day of Shared Science camp. Yes, he knows the difference between this and a trebuchet, just ask him! T got to take home part of the marble run (non-LEGO materials) he made on Day 2 of camp. T signs out on his final day of camp with Shared Science. Bye and thank you Miss Michelle and Mr. E! Thank you Miss Michelle and Shared Science for making an exception for T to attend your camp. I think you know this, too, but he LOVED it. But yeah, yeah, I know, really, RMT’ers, you might be thinking well what kid wouldn’t love a camp based on LEGOs and throwing objects for the fun (and science) of it?! I also want to thank Shared Science for introducing words into T’s vocabulary such as “trebuchet”; I can’t say that I knew the difference between that and a catapult at his age myself. He also taught another adult friend of ours the difference between the two of those contraptions the other day, which speaks volumes about just how much T absorbed while having fun last week also. While we are not currently enrolled in another week at this camp (but we are looking into it because he did love it that much), T has a couple of more weeks of camp coming up with Long Beach Parks and Rec at Wardlow Park’s Pee-Wee Camp. That’s at the same park that he’s playing T-ball for this summer, too. He starts one week from today, and you bet I will be back with another camp-tastic update after his time there! T and his LEGO trebuchet from Shared Science’s summer camp called “Phantastic Physics Fun.” While this themed camp has ended, Shared Science will offer a few more camps and classes this summer. Please check their website for more details. Shared Science just opened a fourth week of half-day camp for Grades 1-to-6 that runs Monday August 19 through Thursday August 22. You can go here for more information on the camp details and how to enroll. If LEGOs aren’t your kid’s thing then go here for a beach blanket bursting with other summer camp ideas for those in the Long Beach (CA) area. There’s just a little more than one week left! 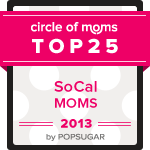 Please vote “Real Mom Time” as a Circle of Moms 2013 Top 25 Mom Blog in So Cal! You can do so by clicking here to vote directly; or, if you want to see the whole list, click the button above and scroll through and find me to vote next to my spot on the list. You can vote once daily (every 24 hours) through Tuesday July 30 at 4 p.m. Thank you so much!